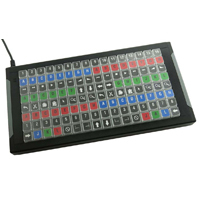 The X-keys XKE-128 USB Keyboard from PI Engineering is an easily customizable programmable keyboard with eight rows and sixteen columns (128 keys total) for building whatever keyboard layout a user needs, including a switching controller for vMix, Newtek Tricaster, or other popular streaming software. 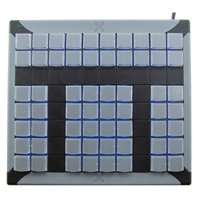 Like similar X-keys products, the XKE-128 model has addressable blue and red backlighting for each key, connects to a computer via a USB connection, and is provided with an SDK for software developers for greater customization and integration with existing hardware. It is also housed in a heavy extruded aluminum case with powder coated finish for added durability. 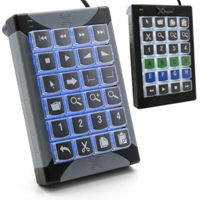 For those who want to use the XKE-128 mainly as a switching controller, PI Engineering also offers a Video Switcher Kit for vMix, Newtek Tricaster, and other streaming software, so that any user can quickly create their layout of choice. This set is a great complement to the XKE-128 as well as the XKE-124 T-Bar Keyboard. 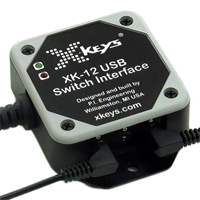 The X-Keys USB 12 Switch Interface from PI Engineering is the ideal solution where a high number of commands, complex macros or long strings of data need to be entered by a single action. 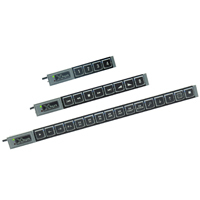 Equipped with 6 input ports this interface can accommodate up to 12 switches with the use of optional splitter cables. With the ability to accept input from switches located up to 1000 feet from the interface module this can be used to activate commands from multiple remote locations, such as in interactive kiosks at museums. The interface memory can retain approximately 1000 keystrokes or commands and is easily reprogrammed using free software for PC, MAC or Android systems. 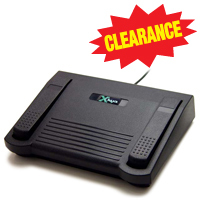 The XK-3 Triple Action Foot Pedal from PI Engineering is a practical method of reducing the risk of finger strain often associated with heavy computer usage. The XK-3 Pedal transfers repetitive actions such as mouse-clicks or common keyboard shortcuts (Copy [Ctrl+C], Paste [Ctrl+V], Save [Ctrl+S]) to the feet. Programming modifier-keys (such as Shift, Ctrl, or Alt) can also help to maximize productivity by allowing the user to continue typing without interruption, quickly accessing modifiers with the feet. In addition, common repetitive content or complex macro sequences can be programmed for quick and accurate entry as needed. Users such as transcriptionists can easily program the pedals to perform their most common commands, freeing them to maintain focus on their work. 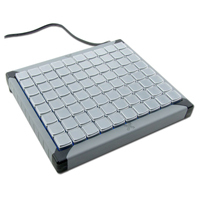 The XK-3 X-Keys Triple Action Foot Pedal features a modern smooth appearance and is available in two distinct styles. While visually identical, the 'front hinged' and 'rear hinged' models are distinguished by the location of the hinge on the large centre pedal. The two outer "piano-key" pedals are always rear hinged and offer two additional discrete actions. 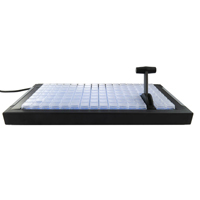 The XK-3 front-hinged model is well-suited for applications where activation is "momentary", such as activating mouse clicks, modifier keys, and macros. The front-hinge design allows the foot to rest on the centre pedal during periods of inactivity instead of being forced to 'hover' or remove their foot from the pedal. For functions where continuous activation serves the task (transcription playback for example), the XK-3 rear-hinged model is more suitable. The rear-hinged design allows the foot to be in a resting position while the centre pedal is depressed. The XK-3 Pedal is equipped with easily-activated switches guaranteed for over one million activations. Activation is audible but very quiet, barely noticeable in most office environments. Users can also connect multiple XK-3 Pedals for enhanced productivity. 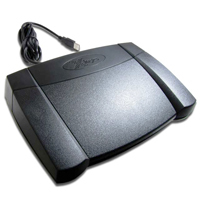 The XK-3 Triple Action Foot Pedal is easily programmed within either Windows or Mac environments using downloadable free software. Advanced programmers may wish to take advantage of the free Software Development Kits (SDK) for Windows, Linux, Android, or Raw HID. The X-keys USB Extender converts the USB output of an X-keys device (or any other low-speed device) to a proprietary signal transmitted over a Category-5 network cable and back to USB at the computer to overcome the three-meter distance limitation inherent in USB devices. The easy-to-install USB Extender needs no special drivers. Just plug it into the computer, plug in the Category-5 cable, and then plug in the X-keys device.